Habit: Annual from taproot. Stem: 0.5--3 m, erect, prickly-bristly. Leaf: few to many, oblanceolate to oblong-elliptic or obovate, margin prickly-bristly, unlobed or coarsely lobed; base sagittate-clasping; abaxial veins (especially midvein) prickly-bristly. Inflorescence: heads generally many, in open, panicle-like clusters, branches often widely spreading; open heads 4--6 mm diam; involucre in fruit 10--12 mm. Flower: 14--20; corolla pale yellow. Fruit: body 2.5--3.5 mm, light to dark brown, rough-hairy, unwinged, faces 5--7-ribbed, beak 2.5--4 mm, thread-like; pappus 3.5--5 mm, white. Chromosomes: 2n=18. 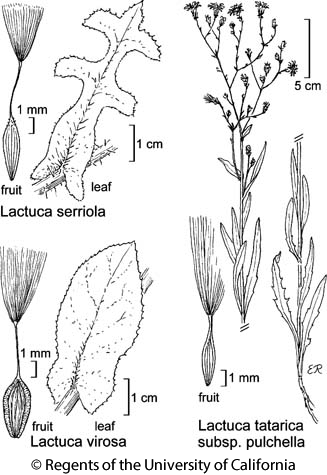 Synonyms: Lactuca serriola var. integra Gren. & Godr. Citation for this treatment: David J. Keil & G. Ledyard Stebbins 2012, Lactuca serriola, in Jepson Flora Project (eds.) Jepson eFlora, http://ucjeps.berkeley.edu/eflora/eflora_display.php?tid=3690, accessed on April 23, 2019.